Wader Quest began with the Spoon-billed Sandpiper when we decided to raise money for the WWT captive breeding programme. 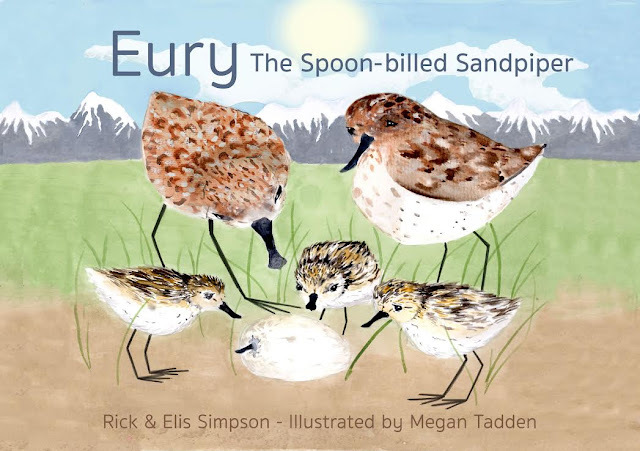 Now, after nearly two years of planning and preparation, working with our illustrator Megan Tadden, with the support of Leica we are very proud to announce the publication of EURY THE SPOON-BILLED SANDPIPER. Follow the adventures of Eury the Spoon-billed Sandpiper from when he was just an egg to being a proud father himself. Join him on his amazing journey from north-eastern Russia to south-east Asia and back again on his first migration south to escape the cold Siberian winter. See what hazards these little birds have to face just to survive each day. There are many natural dangers like foxes and gulls, but many more problems are caused by human beings, what the little birds call ‘the creatures that walk upright’. This is the first phase of a project where we hope to get the book translated into the languages to be heard along the Spoon-billed Sandpiper's flyway and then, if we can get sufficient funding to support such grand objectives, we would like to try to get the book distributed to schools along that flyway. How do I go about purchasing copies of the Spoon-billed Sandpiper book? I can't see how to do it from this website. Hi Mary-Louise, please send an email to waderquest@gmail.com letting us know where you are and we'll reply with the details you need. Sorry for the confusion.